An InDesign training course specially designed for the CHU Angers training department. Staff at the CHU Angers hospital followed a course on Adobe InDesign to enable them to produce their own marketing collateral, by managing the graphic design and layout of the 2015 CHU training brochure. Our team trained them on using Adobe InDesign, and taught them how to track and produce relevant and effective communication tools. The CHU training staff learnt about InDesign layout techniques through hands-on training, and also how to handle and enhance text with this desktop publishing software, along withdesign and layout guidelines. The result is a pleasant and elegant brochure detailing the CHU training offering. Our DTP training courses on InDesign, Photoshop and Illustrator, place particular importance on helping our clients incorporate the practical and efficient features they offer into the tools they already use. All our communications training courses focus on our client's needs. The DTP training designed for CHU staff also covered how to use the InDesign data merge function which allows you to manage the page layout of data variables. We also looked at managing the design chain so they can oversee the production process of the document. Participants learnt to use InDesign's PDF protected file conversion function for sending to print. This allows high-definition printing whilst taking technical production constraints into account (164-page brochure - 4-colour RV - adhesive binding - production specifications). They were also trained on the InDesign interactive PDF export function for digital uses such as the internet, and used InDesign functions to insert hyperlinks and a dynamic table of contents to create an e-book version of the brochure for the hospital website. Learning the finer points of the InDesign publishing software helped the participants master the artistic and technical features of this Adobe suite program and gain a better understanding of the link between the design and the production of their brochure to be used in both hard (print) and soft (online) formats. All our communication training courses are eligible for CPF funding under the French personal development scheme (see details about the CPF below). 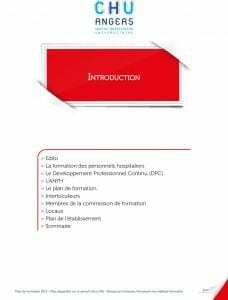 The Compte Personnel de Formation (CPF) system replaced the Droit Individuel à la Formation (DIF) training entitlement scheme on 1st January 2015. Unlike the DIF system, entitlement to training acquired under the CPF is awarded to the person rather than their work contract. • Who is entitled to CPF? > young school leavers seeking work. • How does the CPF work? Every employee has an account (which they set up), where they can track how many hours of training they've earned and a list of courses available. Hours earned are entered into the hours account and entitle the beneficiary to qualification training courses resulting in a certificate or diploma: see the list of courses. If training takes place during work time: the employee must speak to their employer. If training takes place outside work time: the employee does not have to inform their employer. A training application must be submitted to a career development advisor. • How many training hours can be earned? The number of hours earned depends on the number of hours worked. Full-time employees: 24 hrs per year over 5 years; then 12 hrs per year over the next three years up to the threshold of 150 hrs. Part-time employees: the number of hours is calculated for a full year of work, in proportion to the hours worked. • What happens to DIF hours? Any DIF hours not used by 31 December 2014 are carried over as CPF hours and valid for 5 years. To transfer them, the employee has to enter their outstanding hours into their account. Share the post "Indesign training course CHU Angers"